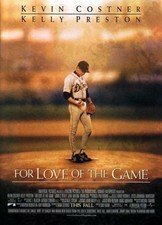 Kevin Costner steps into the cleats once again, playing a 40-year-old Detroit Tigers pitcher wrestling with the imminent end of his career and his latest relationship--all while trying to complete a perfect game on the season finale in Yankee Stadium. Kelly Preston is Costner's girlfriend, about to leave him for a job in England, and John C. Reilly is his catcher. Sam Raimi ("A Simple Plan") directs. 138 min. Widescreen (Enhanced); Soundtracks: English Dolby Digital 5.1, French Dolby Digital Surround; deleted scenes; featurette; trivia; DVD-ROM content; theatrical trailer; scene access.